Family-owned Champagne house Edouard Brun has launched a limited edition porcelain bottle costing €8,000, which it claims is the first of its kind in Champagne. The Aÿ-based producer collaborated with German porcelain producer Reichenbach and American artist James Rizzi on the bottle, which is designed to protect the liquid from ultraviolet light. 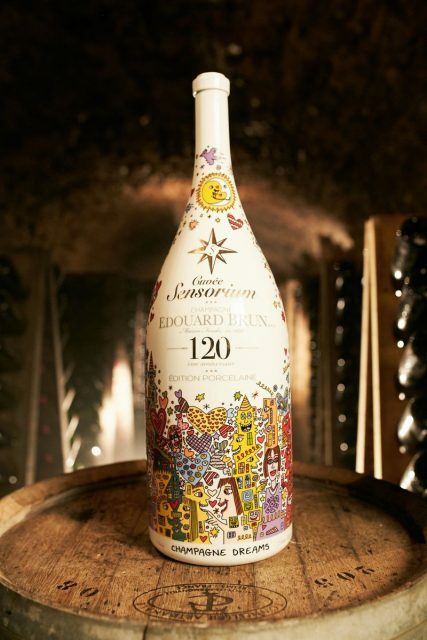 Called Cuvée Sensorium, the Methuselah holds the equivalent of eight 75cl bottles and is inscribed in 24-carat gold. Just 500 bottles were made. Featuring a bespoke design by Rizzi, the fizz is a blend of 70% grand cru Pinot Noir and 30% grand cru Chardonnay from the Montagne de Reims. A plain white porcelain Methuselah of Cuvée Sensorium inscribed in 24-carat gold has also gone on sale for €6,500, while a standard 75cl porcelain bottle will go on sale in 2020. Light is kept to a minimum in cellars to protect ageing wines from its rays, and winemakers traditionally use green glass to filter out unwanted light. Short wavelength ultraviolet light can lead to the release of sulphurous compounds within a wine, tainting it with what the French call ‘goût de lumière’, the ‘taste of light’. Louis Roederer introduced its first brown glass bottles in 2010 after it discovered that brown glass filters 99% of damaging ultraviolet light, while green glass prevents between 50% and 90% of the damaging rays, depending on the shade. Last year Piper-Heidsieck announced that it was moving to brown glass bottles, starting with its brut non-vintage based on the 2013 vintage, which is currently ageing in the house’s cellars. However, porcelain is emerging as an alternative material to glass among Champagne makers in the quest to protect their precious liquid from harmful rays. While Edouard Brun may be the first Champagne house to commercially release a porcelain bottle, it isn’t the first to have the idea. 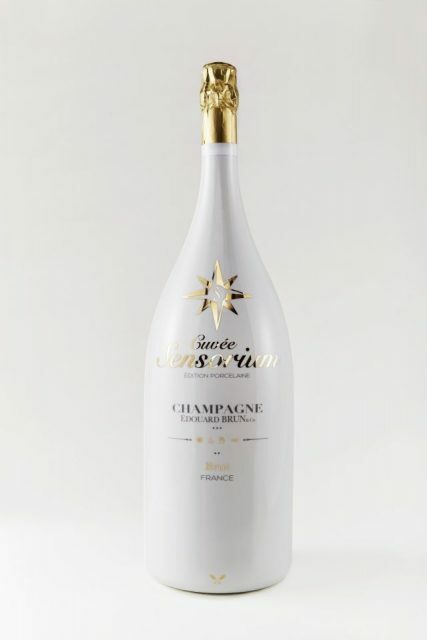 Back in 2013 Champagne Cattier told db that it had collaborated with German porcelain manufacturer Meissen on a limited edition porcelain bottle filled with its blanc de blancs expression to mark its 250th anniversary. Jeff Koons was originally mooted to design the bottle, but the honour has gone to James Rizzi, who also designed the Edouard Brun bottle. Bottling Champagne in a fragile material like porcelain is not without its challenges. The pressure inside a 75cl bottle of Champagne is typically 5-6 atmospheres – more than that of a standard car tire. Founded in 1898, Edouard Brun is based in the grand cru village of Aÿ, produces around 250,000 bottles a year.